New Nova Gem Package For $29.95! What do you get for $29.95? 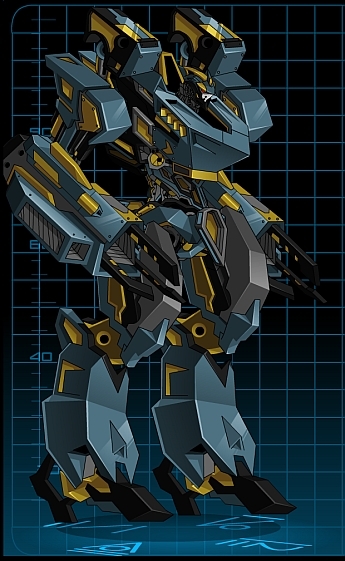 And the Prototype Accelerator Containment Vessel mecha for every StarCaptain on your MechQuest account! What is it? G.E.A.R.S. has many great minds within its halls and they are always pushing the boundaries of what's possible. They came up with a new type of particle accelerator, one that when placed into a vehicle granted it some amazing effects. Upon seeing what it could do in a lesser mecha, the students built this containment vessel specifically designed with combat in mind. It uses the various exotic particles that the accelerator constantly creates to recover energy and keep you in a fight, as well as increasing your combat potential and greatly increasing your chances of winning. The core even has a small chance to create and utilize an as-yet-unnamed particle (only discovered and harnessed by one other, to make the Ubertron). These particles will swap with those in your foe, swapping your HP and EP! The pitfalls discovered in the creation of the Ubertron, however, caused them to come up with a safety mechanism. Upon detection of creation of these particles and the swap with your foe, a safety system will engage and recover a portion of your HP and EP - keeping you in the fight! This prototype accelerator may never see widespread use because of how dangerous it could be if it winds up in the wrong hands. However, YOU have been chosen by the scientists at G.E.A.R.S. to use this one because of everything you have accomplished! Will you be able to use it to its peak potential and show how powerful it can be? - Hit 1: 30% damage, heals 50% of the damage of the hit as HP. - Hit 2: 40% damage, heals 50% of the damage of the hit as EP. - Hit 3: 50% damage, heals 50% of the damage of the hit as both HP and EP. - Inflicts a 2x HP and EP, 3 turn DoT effect. - If the enemy is Equippable will disable enemy HD weapon. - Nerfs enemy Defense by -55 for 2 turns. Nerfs enemy Boost by -45 for 2 turns. - Prevents enemy EP regen for 3 turns. - Buffs Boost by 30 for 75 turns. - Buffs Bonus by 25 for 75 turns. - Hit 1: 50% damage, with 100% chance to crit. If this hit connects will lower enemy ImmoRes by -100. - Hit 2: 50% damage, attempts to stun at current ImmoRes. - 4% chance for hit 2 to swap HP and EP values with your foe and then heal 15% of your max HP and EP. The Traveler is back in town and he has brought a new Back Arm weapon. Here are the specials. 1st use - 2 turn -15 Bonus nerf. 2nd use - 2 turn -10 Boost nerf. 3rd use - 2 turn -15 Defense nerf. 4th use - 2 turn +10 Boost Buff. 5th use - 2 turn +20 Bonus Buff. 6th and higher use - 2 turn +20 Boost Buff, -15 Boost nerf. Thanks for all the birthday wishes on the forums and twitter ... and I haven't even gotten over to Facebook yet. The birthday credits and xp bonus is still in effect through Friday, so please enjoy it! You can also pick up the Otter head and the Pan E-Blades in the Birthday Shop. Ah, and here's Ash now! Greetings! Just wanted to stop in and let you know about a couple of things that'll be happening this week. First off, the Traveler will be leaving to parts unknown this Friday. No one really knows when he'll return so if you want any of his items make sure to get this before Friday evening! 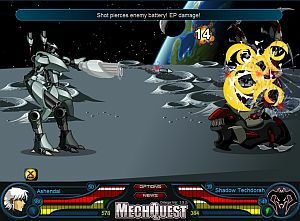 Next, the Chaos Mecha and Items will be moving to the Event screen. You can get there by clicking the Shops button, it's next to the travel button on that bottom bar, and then clicking the "Event" button with the clock picture up at the top. This is also where the free Golden Mecha are, so you can pick one of those up as well. I didn't want anyone to think the Chaos stuff just dissappeared! For the release this week we'll have another quest in the Beard chain! The idea for the whole chain was thought up by Blade and ACW0, so if you like it make sure to let them know! Blade even made a beardy head weapon for this weeks release! I'm able to do quests pretty well now so I'm trying to finish this up for you guys. It's a really cool story and one that's both funny and interesting. Once it's all wrapped up I'll work on the second half of the "Going Gray???" event! Awesome news - the help on wrapping up the "Going Gray???" event is much-appreciated. I'll be super pleased to get Soluna City back to normal... if possible! This weekend only - ALL NEW 4th of July "Haliaeetus" mecha model. The Haliaeetus mecha has all NEW art by Minar and specials designed by Blues, and Vivi! It's in Soluna Main in the Holiday Shop on the sidebar. It'll only be here this weekend though! The art will probably return in the future, but specials won't come back in later years. Each hit heals EP for 50% damage done. Each hit, 50% chance to damage EP for 100% damage done. - Hit 2: 50% damage, tries to stun. Damage increases as enemy EP decreases. 1x/1.5/2x HP DoT. Star Captains can pick up the Traveler Hologram! The Hologram will allow you to access the Traveler's shops, even when he's not in town anymore! Access it in Soluna Main on the sidebar. It won't be available forever, so snag one while you can! To celebrate the Chaos finale in AQW, this week you can show off your chaotic side with a new male and female hairstyle! See HAL in Soluna City East to get your 'hair did!' More Chaos will come ... next week! Enjoy the release, and have a sparkling weekend! Happy Birthday Jemini! Star Captains: Get your Seasonal Rare Jemini Hologram from the shop in Soluna City and display it on your starship. Star Captains: Permanent Version Of Strider Now In SC Club! I would like to thank you personally for upgrading to Star Captain and for your support of MechQuest. This game is so important to me, and it's because of your love of the game that we are able to keep providing updates. Not myself alone - the entire MechQuest team! Greetings! Something I've wanted to do for a while now was get back to doing the monthly SC release. I'm going to be doing something each month now, maybe not a mech each time but something to thank you guys for your support. This month Blues and I wanted to do something really special to kick it off, so we decided on doing the very first SCEM, the Strider. We didn't want to just copy the old one with nothing changed so Blues re-statted it as an offensive mech with a LOT of firepower. Also last week we had the Memorial Day shop. I didn't get the stats to Mae in time for a DN so here they are now!. Nerfs immores (immobility resistance) by -50(-55/-60) and attempts a stun. Rolls for a chance to do a 2 turn energy regen halt. If at least one of the hits connects. Damage increase per use, stacks using either shoulder. +10% damage up to cap of +50% extra damage. Stacking enemy Bonus nerf. -8(-9/-10) per use, either shoulder, up to a cap of -50 Bonus. Stacking Boost buff. +8(+10/+12) per use up to a +40 cap. Hopefully you liked them. Next year will have a different set of effects! Enjoy the new mechs! Well this is embarrassing... there's a critical issue with the Maypril quest involving cutscenes and player positioning that makes it unplayable and that has taken me way too long to sort out. So things remain color-faded until further notice. Which shouldn't be too much longer. But you know what they say about the best-laid plans... mmm scrambled eggs! It'll end up being better than it would have been. We're laying the groundwork for some great new features and continuing to plan ahead for a very exciting set of releases while we work on bugfixing. I am so excited about all of this coming together for you! Greetings! Some of you mentioned that you weren't fans of the way the 4pri1 mech worked, so we took that into consideration for the Maypril mech. Blues and I talked about a few things and we came up with the following for this year. In other news I did a few more revamps for Lagos. 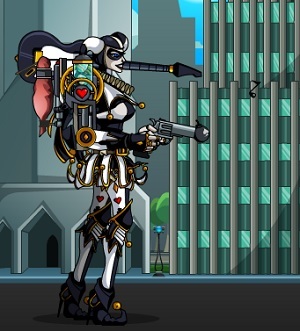 Robina's shops will have a bunch of higher level items for you guys. Hopefully that will tide you all over since I've done about all I can for right now. I'll revisit the planet in the future but I need to focus on some new stuff. Enjoy the F001 and I look forward to hearing what you guys think of it. Greetings! As some of you know I've been messing around with new effects. Welp, I came up with one that is really powerful. It's not just powerful, it pretty much laughs at your opponent. Because of that I built it into a new mech and we're going to let you all have it for a limited time. Now it does have a low chance to activate instead of the normal effect, but when it happens it does some really cool stuff. Since I was given an assignment to create a powerful mech I decided to use the idea and convert the rest of the mech around it. Being all fancy and such I came up with an in-game reason for it. The Nubertron mech is a basic mech many of you are familiar with. It's an alright mech to start off with but it was the perfect test bed for a new power core. This core is a prototype of my own design and is way more powerful then anything I would normally let pilot's take out and use. (Even if you have saved the universe a few times.) I usually wait till I've fixed the power spikes and damage jumps before releasing it, but in this case I just couldn't resist letting you all play around with my prototype. has less health then you, but it could also be amazing if you're down to almost nothing and the enemy is near full. Like I said, it's a prototype and a lot stronger then any other future versions I make will be, but it's a powerful piece of tech I know that you can use. The core has one other side effect. It's increased the damage and effects off all the other built in weapons. It won't boost the damage of non-built in weapons but it does grant a hefty bonus to the current ones. That sounded like an NPC explaining something in game but it makes it sound cooler to hear it like that sometimes. In other news, last week you'll remember that I tweaked some of the Lagos mechs and equipment. Some of you mentioned that those mechs didn't really seem to have a theme after that. They made convincing arguments and showed the pro's and con's of what each mech could have done so I went ahead and redid them along with a few other mechs. All these re-tweaks, along with the tweaks to the Navigator series, the Shadowed Arthurian Lion series, AND the basic Bunzilla's will come tonight after I've had some time to take care of a few more things. I'll be posting a list of all the changes and effects in the DN thread in the MQ General Discussion area of the forums as soon as I get done with it and they are live. I know I also said I'd revamp some weapons. The problem is some of the weapons were supposed to go rare a while ago. That's why once you get to a certain part in the war you no longer have access to some shops. Right now I'm waiting to hear back about if they are alright to revamp and make a shop button for them in the Lagos War finale screen so you all can always access them, or if they are meant to be war rares that got lost in the shuffle. Once I know, I'll be able to proceed. Enjoy the mechs and let me know what you think of the effect! 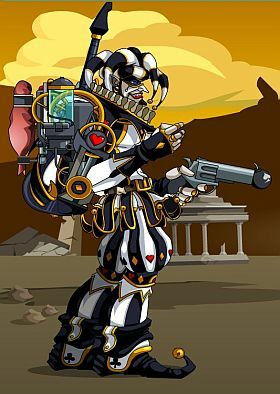 So the Ubertron model will be in the shop in Soluna City Main for a limited time: it will close on Wednesday, April 30th. And then don't forget... Maypril will be here! Maypril f001: This model will be in the shop for a limited time - only until Monday, May the 5th. This one will be available for Nova Gems and will also have credits versions. Enjoy your weekend - I hope it's nice weather where you are! Greetings! As you may have noticed if you follow me on Twitter or visit the forums (you should visit them!) I asked what planet you all wanted a revamp of. The answer was a resounding, "LAGOS! "* So, being the nice guy that I am, I went to work revamping some of the stuff from there. I'll be doing other planets and other places in the future as well so be on the lookout for my next poll of what people want! Enjoy these and the Easter Release! Have fun! *I possibly lost hearing from the amount of yelling for Lagos. ** I don't revamp things early or late. I revamp them exactly when they should be done. Next Tuesday, the Earth Day shop will open in Soluna City, and the weapons will be available for the higher levels this year. Be sure to log in - and as an extra bonus we will extend the DOUBLE REWARDS while the Earth Day shop is open! It will stay open for nine days, closing on May First. May f- ... Maypril! Maypril is coming! The f001 mecha really doesn't want you to use a body attack, so we've been in a long wrestling match with him. Ash & blues have worked out some specials to make this model worth the wait. Will it be ready on Maypril (May the 1st)? Or will we release it without the body attack and fix it later? Who will win? We are very dogged and determined, so you should not be disappointed, whatever happens. And wait - there's more... Part Two of the April Fool mission will finally open for you! We're also working out the details of several projects that are still under wraps, so keep your ears to twitter and your eyes on the forums! Thanks so much for playing and have a wonderful weekend! Part 1 is live now and Part 2 will be out as soon as it's ready. Also the 4pri1 mech has been revived! It's got all new specials that Blues came up with. It's available from the opening of the new quest so go check it out! There were a few bugs when it initially came out but Vivi came in and helped squash the body bugs for me and I was able to fix most of the restof them this morning. Some of you remember that other mech that came out at the same time as the 4pril.Don't worry, we haven't forgotten about it. It will be out...soon. Hope you all enjoy part 1 and part 2 when it's complete! We hope you're enjoying your Lucky Weekend! Special Happy Birthday to Gibby! We've brought back the Giblet Skewer in the Birthday Shop to commemorate the happy occasion. Have you gone up the Rainbow Road to check out the new mission? See Braddock Steele in Soluna City. Be sure to gather clovers to rank up to Ultimate Commander so that you can unlock all the reward shops. 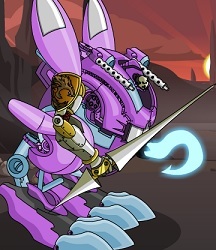 the special bonus all-new LepreScythe mecha (beat the new quest to unlock this shop!). Also, increased chance to encounter Richy the Rich Guy in Soluna City East - all weekend! The new mission has ... not just one, not two, but three beautiful new backgrounds from Minar, along with some shiny buttons. Ash and blues worked together on the specials for the new mecha model, which Ash coded onto it - and Ash even broke out his mad animation skills to create a walk cycle for it! We're having fun learning new skills. 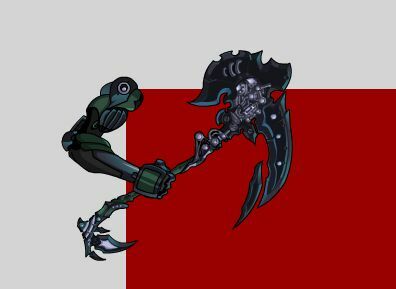 Clarion provided art for the Clover Cutter Poleaxe. This mech cannot equip any items. BUT to make up for that they have been "equipped" with Luck and Accuracy stats. The NG version even gets a bit of Power. Now you can't be "disarmed" by enemies and lose your ability to attack with the NSC/SC models! NSC and SC versions have a Body attack. This button chooses randomly between the two attacks.NG versions are able to pick which attack they want. Inflicts 1x HP DoT that lasts for the entire battle. Dot increases per use and caps at x3. Inflicts 1x EP DoT that lasts for the entire battle. Dot increases per use and caps at x3. Nerfs enemy bonus by -40 for the entire battle. Buffs Boost by 25. Lasts for the entire battle. Increases by 25 per attack and caps at 50 (60/70 for SC/NG). Buffs Bonus by 10. Lasts for the entire battle. Increases by 10 per attack and caps at 40 (50/60 for SC/NG). Inflicts 1x HP DoT that lasts for the entire battle. Dot increases per use and caps at x2. Chance for a 1 turn stun. I don't want to spoil anything but I want you to know that Lyris is working on some amazing stuff that we'll be revealing in due time. We have one word to reveal at this time: BLASTERS! We've got a TON of new stuff in various stages of readiness for you - this is going to be an exciting season for MechQuest! Thank you so much, as always, for your continued support. A general form pops up, with fields to fill in. "That alone would be a HUGE help," she says. Before submitting your report, it would be wonderful if you would: restart browser, clear cache and history, and try to duplicate the bug you're reporting. If you can describe the steps to take to make the bug happen, it will help us figure out how to fix it! Happy Birthday, Dage! 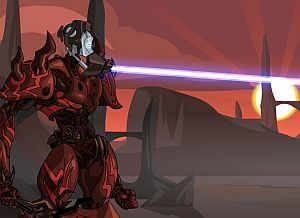 In honor of Dage's birthday, I converted his Blademaster Katana (which he created for AQWorlds) to an MQ-styled energy blade. I also added a magic animation that unlocks if you wear the Ninja costume (found on Planet Yokai). Get yours in the Birthday Shop button on Soluna City's Main Street! Wolfblade- New levels of the WM series arm weapons.- New levels of the WR series shoulder weapons.- New levels and specials on the Spit Fire series! If the attack hits it nerfs the stun resistance of your enemy by 15/30/45 (NSC/SC/NG) and attempts to stun it for 1 turn.- New NSC/SC/NG permanent mods! NSC up to level 48 and SC and NG versions that reach level 50! Runehawk- New levels of the RC series arm weapons.- New levels of the RS series shoulder weapons.- New levels and specials on the Psychic Blast series! If the attack hits it buffs your Bonus by 15/25/35 (NSC/SC/NG)for 2 turns.- New NSC/SC/NG permanent mods! NSC up to level 48 and SC and NG versions that reach level 50! Mystraven- New levels of the RG series arm weapons.- New levels of the RB series shoulder weapnos.- New levels and specials on the Flak Bomb series! If the attack hits it causes a HP DoT based on the item level and item type for 3 turns. It deals 1.5/2/2.5 (NSC/SC/NG) times damage. - New NSC/SC/NG permanent mods! NSC up to level 48 and SC and NG versions that reach level 50! Chain pole series updated! New levels and special. If the last hit connects it causes an HP DoT based on the item level for 3 turns. DoT deals normal (1.5x) damage. Next week, more items from all of Tek's Shops! Same MQ time, same MQ channel! We've got a lot more on the way for you in the weeks ahead. Not just shop updates but also - finally - new missions! Ran into a few technical difficulties that had been causing some delays & Gremlins, but we should be on track again now. 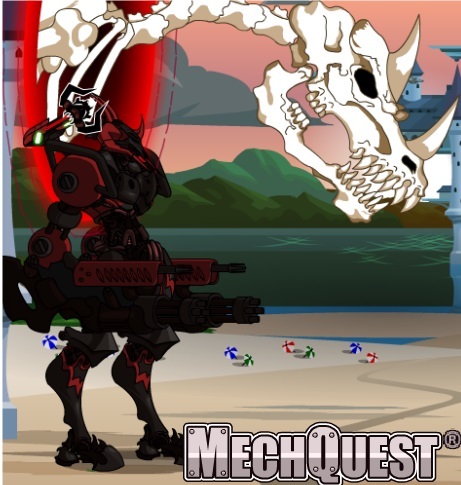 From the menu, choose Mechquest - and remember when you submit a report, details are everything! Thank you all so much for playing MechQuest! Please tell your friends! Cyber Someday! Who knows what day it is in these crazy times? Log in now to take advantage of Cyber Someday! All-new energy blades by Blade and Plasma Charge, plus a new back shoulder weapon courtesy of blues, Plasma Charge, and Vivi. The Green Starflash blade and the Blue Light Special are both Blade's artwork. Plasma Charge did the Cyber Slasher and also spent some time teaching Blade (and me) how the special magic attack is set up for e-blades. It pulls a completely separate file for the magic attack animation and uses very specific coding to make it all work together. So it's more time-consuming than a standard blade (but less complicated than a mecha weapon) - now that more of us have some familiarity with the inner workings, we'd like to start bringing you new magic attacks. SC only: Hit 1 reduces immo res by 80, Hit 2 damages also EP with damage done and Hit 3 tries to stun. Thanks, blues! Also a special thanks to Gianna Glow for helping test. Yeah, the team is having fun with this! I know it's taking longer than I feel like it really should, but we will probably pick up more speed as our momentum gets underway & we hit a new stride. behind-the-scenes: Getting the radio to work... it works just fine as a Starship Item, but getting it to work as a clickable radio in a town or quest file was super-problematic. Either it became unclickable, or resulted in an endless 0% loading, and even the mostly-workable solution using the standard music loading procedure still breaks the on-off toggle switch. It must just be inherently Evil somehow! Also I just realized that after spending many, many hours fixing the replay of Turkageddons past, I did not set them up as playable for you. Better late than never, so that'll come later with more of the Winter Holiday stuff! Mogloween will leave next week, and Tek's Birthday Party will also end for the year. We've still got Flavescent Friday coming soon as well! Thank you all so much for playing MechQuest! Have a great weekend! Today I figured I would walk you down the road of testing a weapon in MechQuest. Something awesome about MechQuest weapons is that each weapon is unique in its own way. Every weapon has a different special, different art, and different effect! Since each weapon is so unique, every weapon must be tested individually to make sure that everything is working. You can't just equip the weapon, say "This weapon looks good" and then release it because there are a LOT of bugs that come up! 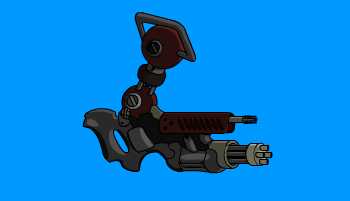 For instance, I just finished a weapon this morning that is releasing later today. I would say I have 9-15 different versions of this weapon, each with little buggies. For this weapon, there are 17 different things that the team and I had to test. The beautiful thing about testing is that you can locate and pinpoint the bug, and then attempt to fix it. In the list of things the team and I had to test, we went down the list one by one, checking off the things that worked and noting the things that didn't. What happened a lot during this process was finding one bug, fixing it, doing a miniature celebration, then find another bug. Rinse and repeat. Last night when I was working on the weapon a rather annoying bug occured. I have since dubbed it the name "Bug of Staying up Late!". Last night, with only one thing to test, a bug that literally defied the logic of math worked its way into the weapon. The bug was: 5 * -7 = 40. Which is false. 5 * -7 SHOULD equal -35. Why was this happening? I reviewed the code with Maegwyn and Vivi about 5-10 times over, and we still couldn't figure out why it was occuring. We decided to call it a night and tackle it in the morning. Boom, 10:30AM and the bug was never a bug. The enemy had an inherent -5 boost, and the -35 was just being added to that. So in all, the code was right, and it's just I never realized the enemy had -5 to begin with. It's safe to say the game trolled me. Well, that's it from me this week. I hope you enjoy the weapon coming tonight! It's called the "Valoth's Epic Shredder" series. Commemorative only: General damage boost of +20(25,30%) and BtH boost of +50(60,70) against Shadowscythe and Ebilcorp enemies. I'm actually transmitting to you from the Secret Underground Lab, which I can tell you is a far drive from my Undisclosed Location. I battled the elements to get here - Water and Lightning were especially strong, and Darkness turned out to be a factor in the end. Mission Accomplished - I'm sitting across the desk from Korin! Thanks to blues for the specials, and to Vivi for doing the coding! SC Club "SCEM" for Levels 43 and up! With last week's Automorph-P release, many of you asked for it and other models to be released for the higher-level players. I'm going to show Practel how to add the scaling code and I'll make the new database entries for this Friday's release. Automorph-P, Dharmahp-P, and Falcon-P will the the models getting the higher levels this week! Tweet #MechQuest: Send out a tweet using the #MechQuest hashtag with your wishlist of non-rare weapons and mecha models you'd like to see at higher levels. The weapons are the very fastest for me to put together so if you get me a list I should be able to add a TON of them! Isn't that beautiful?!!? Nice work, Plasma Charge!